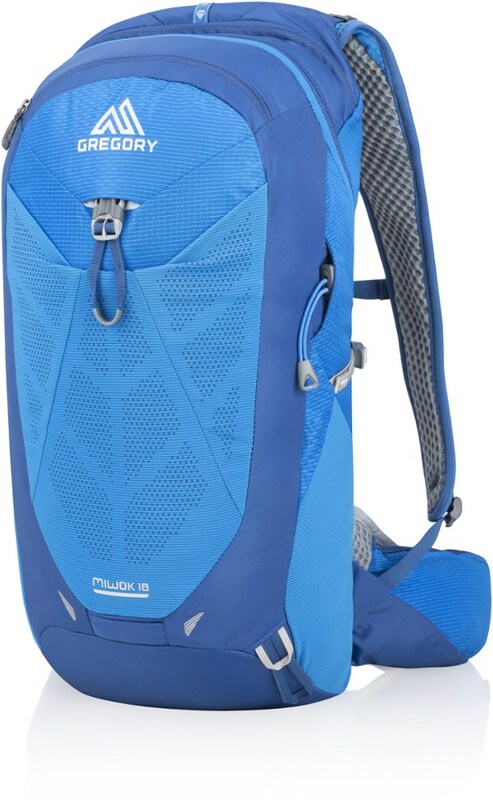 A rugged, roomy pack for day hikes, with a lot of attention to detail, but the omission of a quick disconnect for the hydration reservoir as a standard feature is a frustrating flaw. The hydration reservoir lacks a quick disconnect—but Osprey will be happy to sell you one for another $10. 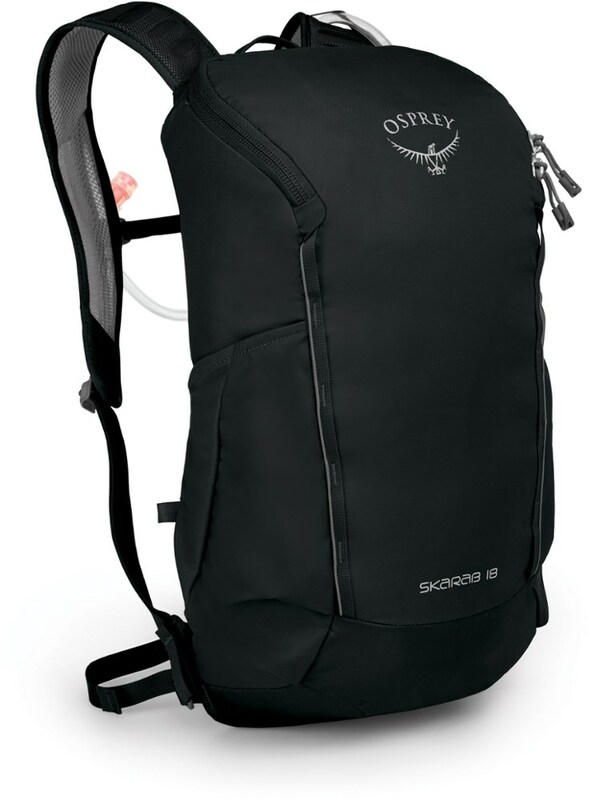 In my opinion it should be included as a standard feature, even if Osprey has to jack up the price. Here’s why. As delivered the reservoir hose is routed through two sewn-in strips of webbing on the shoulder straps, which hold it firmly in place. This is good because it keeps the hose from bouncing around or hooking on passing vegetation. With a little wiggling, the mouthpiece and the magnet fitting that is used to park the hose on the sternum strap can be pulled through the lower of the two retention strips, but there is no way they will fit through the upper. The only way that I’ve found to do that is to remove both bite valve and magnet, which means that water can squirt out of the open end of the tubing when loading the pack up with a full reservoir. 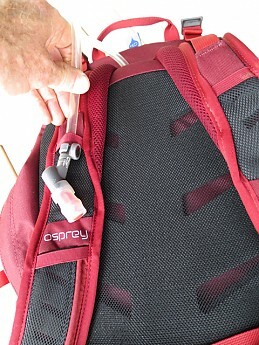 For the time being, I am using the pack with only the lower retention strip, but it really bugs me that the pack seems pretty clearly to have been designed to have a quick disconnect for convenient filling of the reservoir, but Osprey has chosen to make it an add-on at customer expense. I wrote to Osprey about this. They had me fill out an online form, but after that referred me to Hydrapak, the maker of the reservoir, who kindly offered to sell me the part. 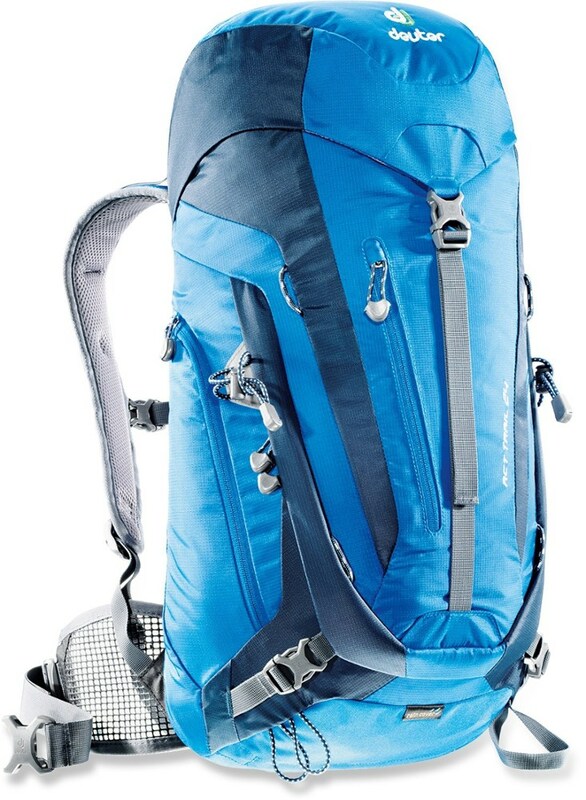 I pointed out to both that I thought it should have been included, indicated that I would return the pack to REI rather than pay for the part, and noted that I would be reviewing the pack on Trailspace and REI. With that they have agreed to send me the part, saying that it may take two weeks to get here. I’m not holding my breath. The whole thing has been a bit of a runaround, and I am disappointed both that Osprey would leave this critical functional feature out and that they weren’t more responsive. Another quality gear manufacturer getting too big for its britches? The main materials for the body of the pack are “Double Diamond Ripstop” and a cordura-like packcloth. 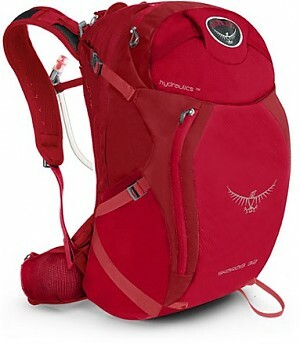 I have use the pack on some hikes and scrambles in the Rockies and around Tucson and it is holding up well. 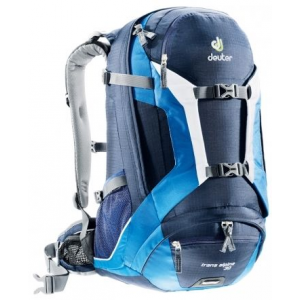 It loads and carries well and is very comfortable within the recommended weight range. The hip belt is very lightly padded, just enough to take some of the load. The shoulder straps are also lightly padded as appropriate for the recommended maximum 25 lb load, with mesh on both sides. The foam strips inside have a row of cut-outs to allow for some aeration, as does the mesh-covered back panel. 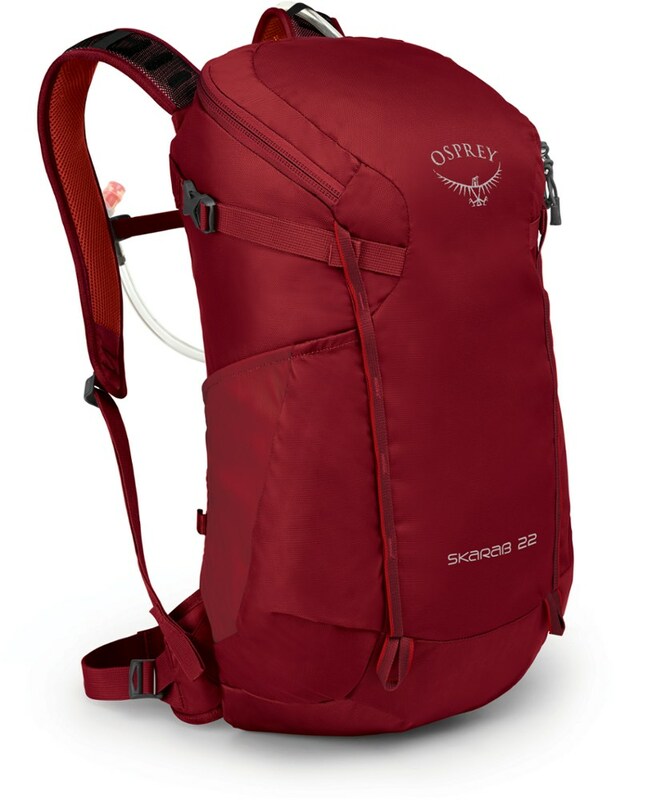 The back panel is not as breathable as some of Osprey’s more luxurious designs, but no pack is sweat-free. The back is supported by a somewhat flexible plastic strip up the middle, just enough to keep if trom collapsing when partially loaded. Without the reservoir my M/L weighs in at 900 g (just about 2 lb) on my kitchen scale. The reservoir and hose adds another 170g (6 oz). This gives a total weight about 200 g (7 oz) greater than that quoted on the Osprey web site. 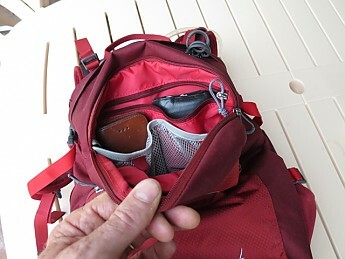 The main compartment is accessed by a two-way, wraparound zipper that runs about three quarters of the way down on both sides. While I have a healthy distrust of zippers, it does give good access to items stashed in the very bottom of the pack. Plenty of room in there for rain gear, layers, lunch, and crampons or a bottle of wine (or maybe both). There are zippered pockets both inside and outside, the latter with a mesh organizer and key clip and a zippered inner compartment for valuables. I tend to use the inner pocket for snacks, the outer for keys, wallet, phone, compass, sunglasses, and the like. So far we’re up to four zippers. Add two for the two stretch mesh hip belt packs (energy bars on the left, gps, phone, or point and shoot on the right), and one for the pocket on the front panel (room for maps and guidebooks) for 7 zippers total. 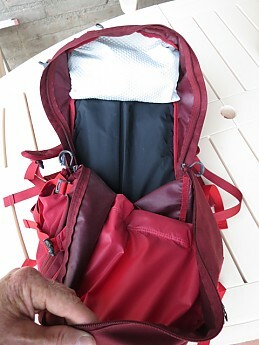 As with many other packs these days, the front panel hangs from the compression straps to provide a good place for wet rain gear or overflow items. Finally, two big stretch mesh side pockets can accommodate water bottles or maybe indoor shoes when in commuter mode. With all that space and a full 2.5 l reservoir, it wouldn’t be too hard to exceed the load limit—would I do a thing like that? The reservoir is light, has baffles to keep it from getting too fat, and the fold-over sealing system opens wide for filling and cleaning. The PVC-like material is said to be BPA- and phthalate-free, but imparts a nasty chemical taste that takes a few uses to leach out. The Osprey description says that the reservoir is not included in the international version, but I see that the reservoirs are sold separately in Europe so I guess they meet European standards. The hydration sleeve is external, so there is no need to route the hose through a port into the main compartment (but there is the hose routing problem noted at the start of this review). 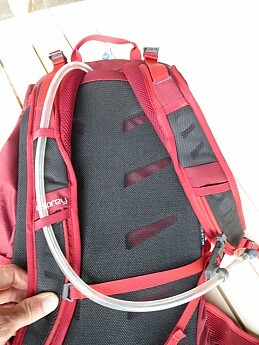 The hose has a nifty magnetic attachment to the sternum strap to minimize that annoying swing, and the bite valve seals with a twist to avoid accidental leakage. All very nice. It's tempting to take a full star off for the glaring omission, but in the end I have to admit that this is a very well-made and -designed pack and I hope to give it a long, hard life. 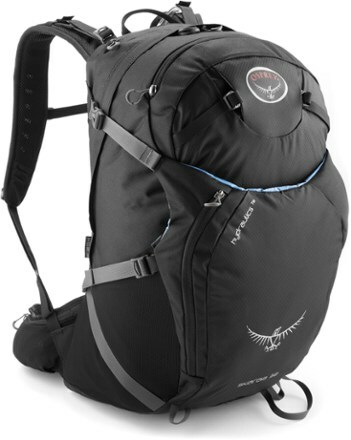 Very good review, when I bought my newest pack it was a toss-up between the Skarab 32 and Manta 36 AG. 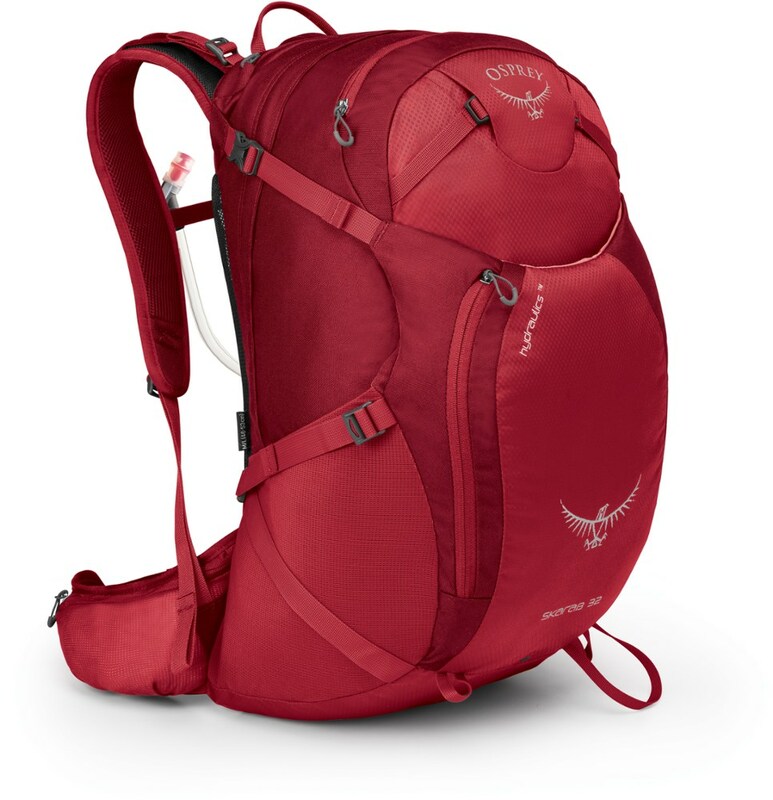 I went with the Manta because I already had a 28l pack and 4 more liters didn't seem like it'd be worth the money. Nice review, BigRed! I hate when I have to mess around with hydration tubes that don't fit well through holes and such, especially if they're the ones that came with the pack.